Monterey Park, CA—Thursday, July 14th Monterey Park Rotary had a special celebration to say good-bye to Past President Tim Motts, Executive Director of the Boys and Girls Club of West San Gabriel Valley. Motts and his family will be moving to Hawaii in mid-August to become the Executive Director of the Boys and Girls Clubs of Hawaii (BGCH), which operates twelve sites on Oahu and Kauai. Each site provides programs for children 7-17 six days a week, and together the sites touch the lives of nearly 4,800 members and provide services to an additional 5,000 youth each year. Monterey Park Rotary President Allison Yu, Councilmember Teresa Real Sebastian, Motts and Mayor Betty Tom Chu. Mayor Betty Tom Chu and Councilmember Teresa Real Sebastian presented a certificate of appreciation for service to Motts. During Motts’ Presidency Monterey Park Rotary started an Interact Club with 25 members at Mark Keppel High School, acquired a grant and created a community garden at the Boys and Girls Club, contributed to Rotary District 5300’s annual Peace Conference, aided the fundraising efforts for earthquake/tsunami relief, held its third annual Casino Night fundraiser, contributed to the City of Monterey Park’s 4th of July celebration and served dinner to needy families at the Boys and Girls Club’s Thanksgiving event. President Motts used his year in leadership to ensure all members of Monterey Park Rotary contributed to Rotary International’s Foundation, which continues to work to eradicate polio, build water wells in Africa and do other projects around the world. Previously, as President-Elect Motts led a team from the Boys and Girls Club to Africa to build a school. Motts has been a member of the Monterey Park club for four years and has been working with youth through community-based organizations since 1997. He is married and has two boys. Monterey Park Rotary of the good-luck dragon with from left to right Monterey Park Rotary President Allison Yu and Motts. 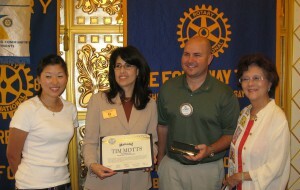 Monterey Park Rotary also presented Motts with a lucky dragon plaque for his service. Monterey Park Rotary, Mayor Betty Tom Chu, Councilmember Teresa Real Sebastian and Tim’s wife Alison and son Jaxson. Rotary International is the oldest and largest service organization in the world. 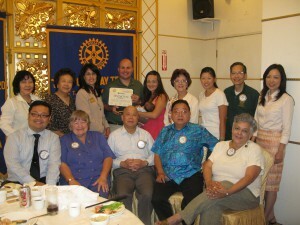 For information on serving your local community through the Monterey Park Rotary, check http://www.clubrunner.ca/CPrg/home/homeA.asp?cid=4711. Monterey Park Rotary usually meets every Thursday at 12:15 P.M. at Capital Seafood, 755 W. Garvey Avenue, Monterey Park. For more information on Rotary International and clubs in other communities see http://www.rotary.org/EN/ABOUTUS/Pages/ridefault.aspx.